With a Commons Select Committee investigating football's governance and ministers railing against the way the game is run, the latest edition of United fanzine Red News, had an interesting press clipping showing how things were done back in 1909. Having finished Champions in 1907/08 (see photo), United won the FA Cup in the 1908/09 season and had upset the FA in various ways (including outrageously having a replica of the FA Cup made). This was also the time of the ill-fated player rebellion over their attempt to unionise. 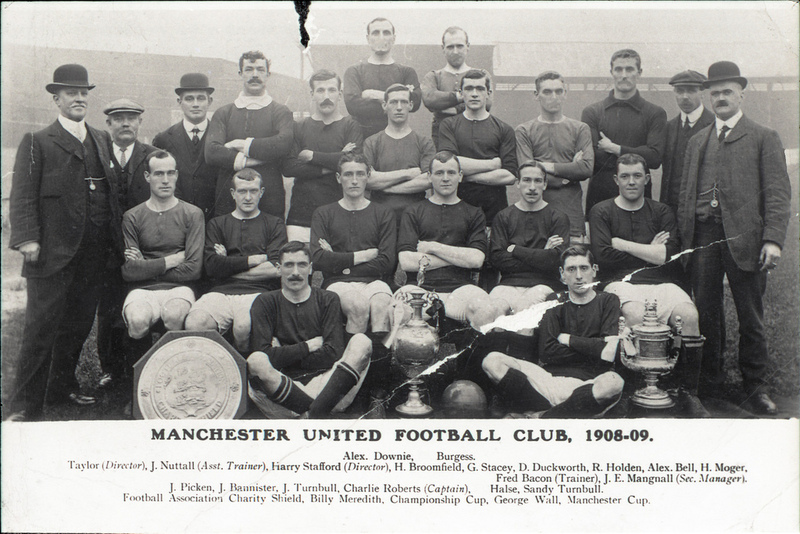 United were being bankrolled by local brewer John Henry Davies who put up the £60,000 to build Old Trafford. 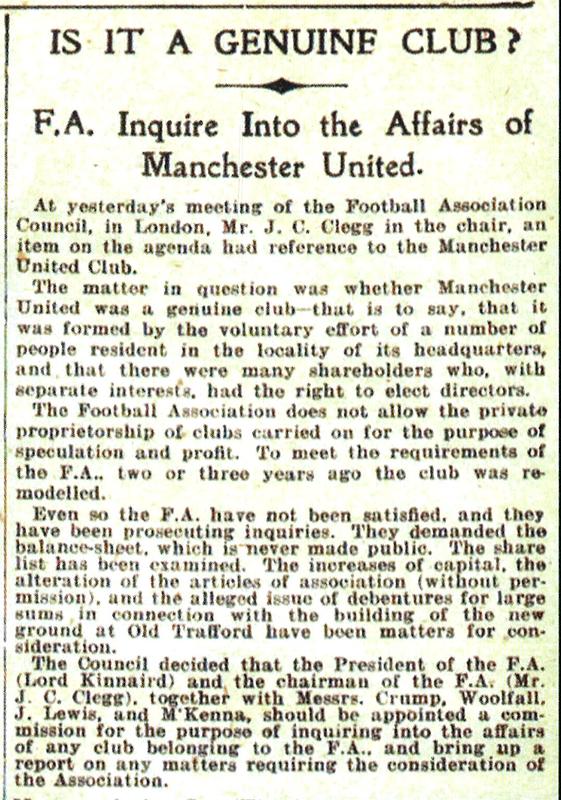 As you can see from the clipping from the Daily Sketch on 7th December 1909 below (reproduced with kind permission), the FA had suspicions that United were not a "genuine" club under its rules. 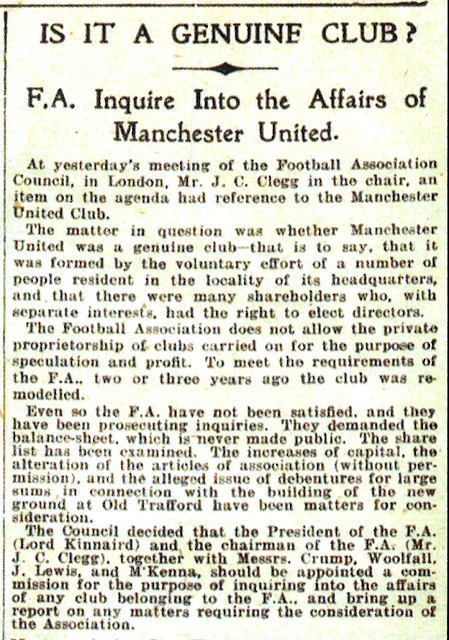 Whatever the rights and wrongs of United's actions in 1909, it is worth noting what the FA rules said at the time. "...that is to say, that it was formed by the voluntary effort of a number of people resident in the locality of its headquarters, and that there were many shareholders who, with separate interests, had the right to elect directors." "The Football Association does not allow the private proprietorship of clubs carried on for the purpose of speculation and profit." "they [the FA] have been prosecuting inquiries. They demanded the balance-sheet, which is never made public. The share list has been examined [any Qataris on there?]. The increases of capital, the alteration of the articles of association (without permission), and the alleged issue of debentures [bonds] for large sums in connection with the building of the new ground at Old Trafford have been matters for consideration." None of the stipulations above exist in the current FA rules of course, but wouldn't the game be better off if they did? Why were restrictions on "speculation and profit" removed? Why are individuals allowed to own clubs, rather than diverse groups of supporters? Why is there so little financial scrutiny of debt and accounts? Unintended consequences – could Financial Fair Play kill small clubs’ youth development? The Telegraph ran an interesting piece last week on possible changes to youth development among Premier League clubs. Suggestions include doing away with reserve team football in favour of an under-21 development league, the end of Centres of Excellence and (possibly) the abolition of the "90 minute" rule that stipulates that youth players must live within a 90 minute commute of their club. These suggested changes are being considered at a time when UEFA's Financial Fair Play ("FFP") rules are coming into force for clubs seeking entry into the Champions League and Europa League. Together, they could have radical and possibly dire consequences for smaller clubs' youth set-ups. Here's why. FFP has the laudable aim of stopping clubs spending unsustainable amounts on short-term investment such as player wages and transfers whilst allowing unlimited funds (if available of course) to be sunk into longer term activities such as youth development and stadia. Appropriate adjustment may be made such that youth development expenses are excluded from the calculation of the break-even result. Expenditure on youth development activities means expenditure by a club that is directly attributable (i.e. would have been avoided if the club did not undertake youth development activities) to activities to train, educate and develop youth players involved in the youth development programme, net of any income received by the club that is directly attributable to the youth development programme. The break-even requirement allows a reporting entity to exclude expenditure on youth development activities from relevant expenses because the aim is to encourage investment and expenditure on facilities and activities for the long-term benefit of the club. So clubs can spend as much as they want on youth development and none of the cost is included in the calculation of their breakeven figure. Increasing youth expenditure doesn't reduce losses, but for clubs with wealthy owners which are constrained from traditional spending on transfers etc, this is a permitted outlet for their largess. Why would such clubs want to invest heavily in youth? Firstly, of course because it is a cheaper way of building their squad. It is far less expensive to develop players in-house than dip into the always over-heated transfer market. Secondly, it has been shown to be something of a winning strategy at clubs as diverse as Crewe, Barcelona and United. 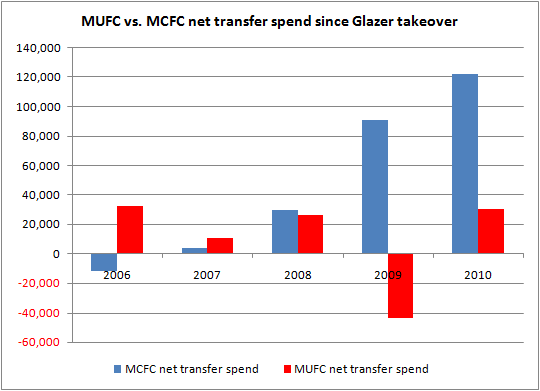 Finally (and crucially), because a successful youth set-up can itself be a good engine for income under FFP. And this could have unintended consequences for all clubs. Financial Fair Play – "profit on disposal of player registrations"
Whilst youth development spending is specifically excluded from "Relevant expenses", profits from selling players are specifically included. The notion of "profits" from selling players often rings hollow with supporters are they represent the transfer fee received compared to the "book value" of the player, not what was originally paid. For players who came through youth systems, with no (or very low) transfer fees being paid, the "profit" on selling the player = the transfer fee received. Developing players and selling them on generates "pure" profit under FFP which can be included in the breakeven calculation. United made a profit of c. £5.4m per year in the last four years from selling on players who came through their youth programme. That's a serious amount of money, from a part of the club that "costs" zero under the FFP rules. As clubs look to comply with FFP, spending to create a United-like "factory" that produces young players will become more and more popular (indeed we can see City doing it already). Add in the mooted changes to the Premier League rules (especially the "90 minute" rule) and such a strategy becomes even more attractive. The consequences of this for smaller clubs, who have traditionally looked at youth development as a key part of their model (selling on the most bankable to Premier League clubs and keeping others to avoid transfer fees) could be very bad. Bigger clubs, especially those with benefactor owners, will step up their search for the brightest and best nationwide and internationally. It doesn't matter if such players are needed by the big clubs, they can just be sold at 100% FFP "profit" to teams lower down the pyramid. Ironically, FFP and the new PL rules could mean that smaller teams end up buying back players from Premier League clubs who they would otherwise have developed themselves. UEFA and the Premier League need to keep a careful eye on this area as the rules are developed and implemented. The obvious solution to prevent big clubs building "youth factories" largely with the aim of selling players on would be limits on youth squads and/or retaining rules on players joining their local clubs. It's certainly an area to watch. "If you look across sport, it is very clear to me that football is the worst-governed sport in this country, without a shadow of a doubt. The levels of corporate governance that apply to football, a point often addressed by [Labour], lag far behind other sports, and other sports are by no means beacons in this regard." Not only did Robertson (correctly) identify the problem, he promised action. "So, action is needed and the Government will take it, but it wants to see the results of [the Department of Culture Media and Sport] select committee first." How is it that no Bundesliga club has ever gone bust or into administration yet dozens of English clubs have? Impossible in most European leagues, banned in the NFL(!). Adding debt to a club for the privilege of having new owners. Nothing added, nothing invested. Why is there no help (or even preference) for the most natural owners to take a stake in their clubs? Instead we end up with the crooks, carpetbaggers and dodgy dealers who have ruined so many. Record income flows into our game and yet prices rise inexorably upwards with supporters priced out. £100 for a non-executive ticket at Arsenal? Laughable. Responsible for the debt ridden shambles of "Nu Wembley", the decline of the FA Cup and the shambolic England team and its manager. Not fit for purpose. Financial inequality in the game – Champions League qualification makes you rich, PL mid-table makes you worry, relegation could send you broke. Lower than that clubs fight for scraps. Why hasn't there been a proper debate on this? Visit a German stadium and see how they do it (no doubt they would sell us some of their highly engineered safe standing barriers). You may have your own issues you would add to the list. Some, such as the level of player wages, seem to me to stem from the no. 1 problem, financial mismanagement. I believe that if Hugh Robertson is serious about taking action on football "governance", these are the issues and benchmarks against which he and the government must be measured. David Gill today reaffirmed his confidence in United's business model and our ability to compete financially with City. I don't disagree that United generates excellent profits. It's also worth remembering that the club has built up (at 30th September 2010) a cash pile of £151.7m primarily from the unspent Ronaldo money and the Aon prepayment. David says that "We can compete, we can compete for top players". That may be true, but all the evidence is that whatever we "can" do, we haven't chosen to spend very much, certainly no where near as much as City. For whatever reason we have allowed huge amounts of cash to build up on the balance sheet and have spent little on either transfers or capital expenditure (except in 2006 when c. £30m was spent on completing the quadrants). I and many other commentators thought the cash pile was going to be used to repay the PIKs, but they have been dealt with from a mysterious, unknown source. 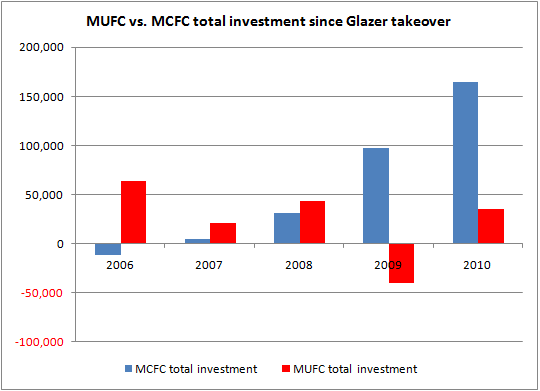 The Glazers retain the dividend rights (currently they can take around £120m if they wish) that were secured with the bond issue, at a cost in higher interest payments of course. Perhaps that is why we are sitting on all this money. Our record on the pitch in the last few years hardly cries out for a Cityesque splurge of transfers, but it's also worth remembering that none of United's cash has been used to reduce ticket prices or on expanding the ground since 2006. This is the second in a series looking in detail at Manchester United's finance. In December I wrote about the various sources of revenue the club has. This post looks at operating costs. Revenue minus operating costs equals the famous "EBITDA" (earnings before interest, tax depreciation and amortisation). I will write separately about the costs that come below EBITDA, namely those relating to player transfers and of course interest and related charges. Compared to the complexity of revenues, the costs involved in running a football club are pretty straightforward. The cost of the playing squad and coaching staff dominate the total expense bill. Whilst wages have always been the single largest cost, their explosive growth in recent years have made them even more important. By way of illustration, in 1998/99 when United won the Treble (paying out significant bonuses in the process) wages represented 50% of total operating costs. In the most recent year, 2009/10, wages had risen to 73% of total costs. 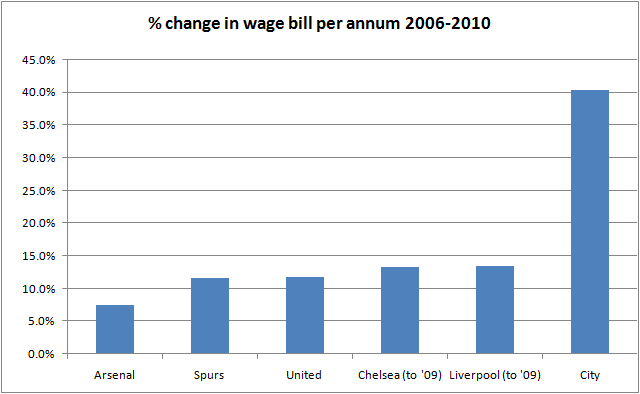 Over the eleven years since the Treble, United's wage bill has grown 356% or 12.2% per year. A staggering £959m has been paid in wages, bonuses, social security costs and pension contributions. It has been a good time to be a Cheshire Ferrari dealer. As with revenues, the 2006 Investment Memorandum (the "2006 IM") provides a breakdown costs (£114.6m) in 2005/06 and I have used this document along with recent report and accounts to analyse the club's cost base. In 2005/6, player wages, bonuses and social security (National Insurance) costs totalled £61m or just over half the cost base. Directors were paid £2.6m and other staff (including of course Fergie and his coaching team) cost £20.7m (18% of the cost base). The report and accounts for 2010 do not give such a full split, but looking at the various subsidiary accounts (see footnote) it is possible to estimate the split of the 2009/10 total wage bill of £131.7m. On my estimate player costs have risen by two thirds over the four years (13% per annum). The accounts show directors' remuneration has increased 47% (10% per annum). On the assumption that other non-coaching staff costs have risen with inflation, the cost of Sir Alex and his coaching staff has risen c. 40% (9% per annum). This massive increase in staff costs is not of course unique to United. 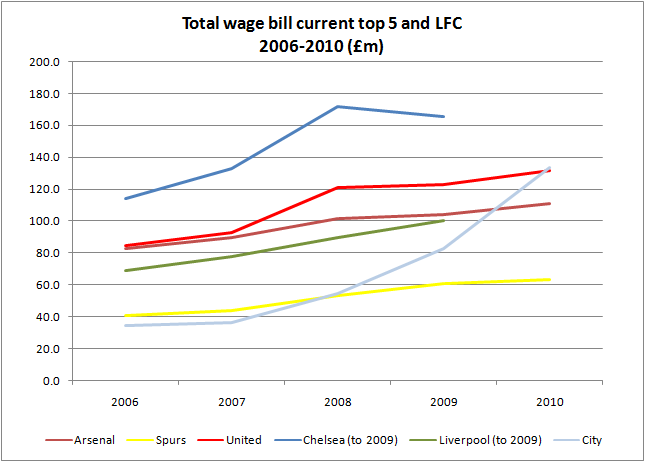 We do not yet have figures for 2009/10 for Liverpool and Chelsea but the graphs below shows how all the major clubs have seen wage inflation running at very high levels over the period (City's wage bill increase is not of course "inflation" in the same sense). The 2006 IM identifies three other types of cost. "Matchday variable costs": these relate to the expenses of running Old Trafford itself and clearly will alter from year to year depending on the number of games played. In 2005/06 there were 27 home games meaning each one cost around £470,000. In 2009/10, there were 28 home games played in a bigger stadium (consuming more power, needing more security and staff etc, etc). Taking inflation and the stadium expansion into account, I estimate each home match now costs around £750,000 (this tallies with figures for a reduction in variable costs due to fewer home games given in the 2009/10 full year results presentation). "Other variable costs": this includes travel for the squad and coaching staff. This fluctuates depending on where United go on pre-season tours and how far they progress through the Champions League. "Fixed costs": everything else! This element appears to have risen very sharply over the last four years. I have two theories about this, firstly that this includes some of the (non-staff) costs of the club's Pall Mall commercial operation (such as rent and fees paid to intermediaries on commercial deals) and secondly that "fixed costs" may include player image rights. United and other clubs claim that image rights are not income, but rather commercial arrangements with players. HM Revenue and Customs dispute this and there is a case slowly chugging through the courts at the moment that will determine who is correct. The January 2010 bond prospectus gave an insight into the scale of image rights payments by United. The prospectus said that in the event of HMRC winning any future litigation against the club, there may be a liability of £5.3m relating to the employer's NI not paid on image rights from 2000-10. Employer's NI is around 12% and so that figure would imply total image rights payments of c. £44m over the ten year period, equivalent to 4.6% of the published wage bill. The accounting treatment of such payments is not clear, but I find it unlikely that the club accounts for them under "wages and salaries" when it is so adamant that they are "commercial" payments. This could be where they sit. Since the takeover Manchester United Limited (the old plc) has had a parent company, Red Football Limited. This entity needs its own auditors, lawyers, bankers etc and costs around £1.2m per annum. In 2006, MUTV was not consolidated into United's accounts. Since ITV's one third stake was acquired in November 2007, it is consolidated as a subsidiary. 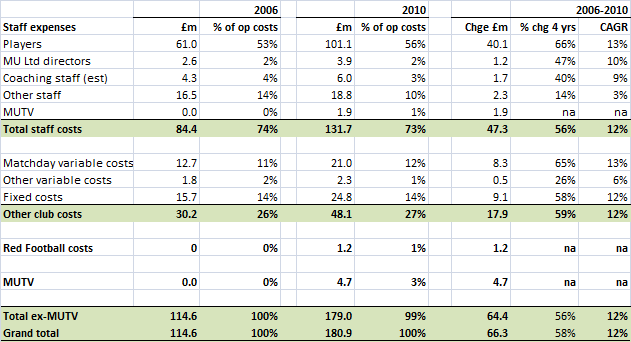 MUTV's operating costs for 2008/09 (the last year on which it has reported were £4.7m. Cost growth of 12% per annum is very high for most industries but not a problem if income growth keeps pace. For Manchester United, the even faster growth in revenues over the period has meant that EBITDA margins have actually risen from 30% in 2005/06 to 35% in 2009/10. The questions for the future are whether costs will continue to rise as quickly as they have over the past few years and whether revenue growth can continue to outstrip cost growth. The principal driver of football wage growth has been the explosion in the value of TV deals. Put simply, players, agents and managers demand a share of the growing cake and generally they get it. The chart below shows how the two years when United's wage bill increased the most in the last decade (2002 and 2008) were years when new higher value Premier League rights deals came in. By contrast the three year deal beginning in 2004/05 (when Sky bid alone for domestic rights) saw a reduction of 18% in the value of domestic rights compared to the previous deal and it is noticeable that wage growth was very low during this period. 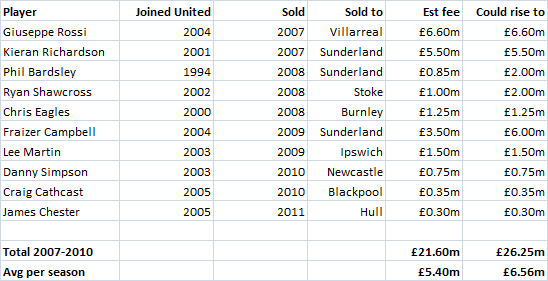 The most recent premier league deal covers 2010/11 to 2013/14. Although international rights were sold for more than double the value of the 2008-10 deal, a very small increase in domestic rights and changes in parachute payments means that each Premier League club will only see a c. 10% increase in PL TV income. In addition to this slowdown in media growth, many commentators expect the looming UEFA Financial Fair Play rules to dampen wage pressure across Europe as clubs look to bring costs in-line with income. This seems logical, but so far there is little sign of it. 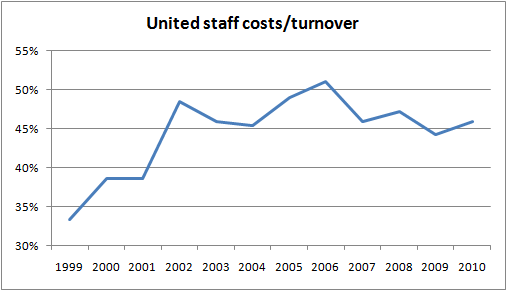 United's 7% increase in staff costs in 2009/10 vs. 2008/09 is worrying as the increase happened despite lower bonuses (we didn't win the league or reach the Champions League Final as we did in 2009) and also despite the departure of Ronaldo and Tevez. This trend was further confirmed in the first quarter figures for 2010/11 which saw staff costs rising 14.8% compared to the previous year. This first quarter figure is particularly surprising given that it didn't include Wayne Rooney's much publicised pay rise (I appreciate one shouldn't read too much into one quarter's numbers). If press reports about Rooney doubling his salary from £90k to c. £180k per week are correct, he alone will drive up United's wage bill by 3.5% this year. There are two schools of thought about football's runaway costs. Some (like NESV, who bought Liverpool last year) believe that UEFA's new rules will naturally end the arms race in player salaries. If the biggest clubs have to breakeven or face a ban from European football then costs will have to rise in line with revenues or even fall for a period. That view certainly tallies with the actions of Chelsea who have trimmed their playing squad and allowed expensive older players to leave on free transfers. The other view is that so few clubs will meet the Financial Fair Play criteria that the rules will be fudged and that things will continue as they are. The Rooney-United tussle ended with the player winning the battle and another £4m+ being added to the salary bill showing the jury is out. The separate accounts of Manchester United Limited ("MUL"), Manchester United Football Club Limited ("MUFC") and MUTV give us some detail on who is paid what. Of the £131.7m total salary bill, MUL pays £19.8m and MUFC (which employs all the players, ground staff and ticket office staff) pays out £111.9m. 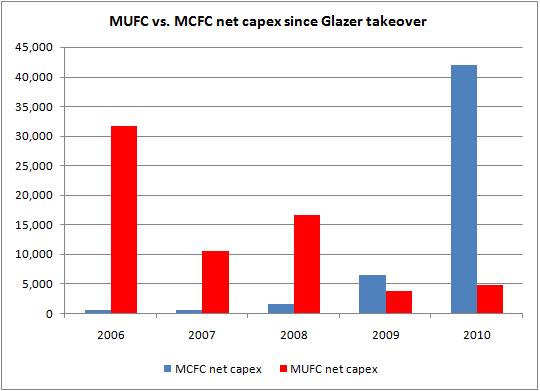 MUL pays for its Directors (Gill et al) and also pays for the MUFC board (Sir Bobby Charlton etc). We can deduce from these figures that Fergie and the coaching staff must be employees of MUL, otherwise the average MUL salary for the 179 non-directors/MUTV employees (including 64 people employed in catering) would be an implausible £70k each. I have had to estimate (using various press reports) what Fergie and the coaching staff earn and have come up with a figure of £6m. People may think this is too high or low, but at 4.5% of total staff costs small errors are not material. Using this estimate, gives an annual cost of £38,500 per head for the all the admin, ticket office, Pall Mall, catering and ground staff. This leaves the princely sum of £101m for the 68 players on the club's books in 2009/10 (£1.49m pa or £28,600 per week). That of course is an average.